Spoiler warning: As if this isn’t obvious, the feature below contains innumerable spoilers about Star Wars: The Force Awakens. Having now seen Star Wars: The Force Awakens twice, I can breathe a certain sigh of relief. In a film that has already been judged with a much sharper critical eye than any of the prequels, we, the geeks who love the Star Wars universe, have at least come to the conclusion that the first entry in the new series is very entertaining, if not entirely sensible. But The Force Awakens succeeds where it counts: Introducing new, interesting characters who are immediately engaging. We want to learn more about Finn, Rey, Kylo Ren and Poe Dameron, and we can easily recognize that they’re flying around a universe that simply feels like Star Wars. Making us care about the new characters was the single biggest hurdle faced by the new series—particularly with the presence of old favorites returning and threatening to overshadow everything—so the film’s success here goes a long way. And yet, there are of course no shortage of nitpicks one can make, even while agreeing with Paste’s positive review. The film has some issues of streamlined storytelling typical of J.J. Abrams’ other movies—a smoothed-over quality that sometimes feels like an overreaction to prequel criticisms of things getting bogged down in “politics” and exposition. That’s not what I want to talk about here, though. What I want to do here is bring up three specific things I really hope to see in Star Wars episodes 8 and 9 … but don’t expect to receive. I’ll try to make a case for each, and why I believe it would make for a more satisfying Star Wars as a whole, rather than the alternative. Wish #1: Rey is not Luke Skywalker’s daughter. I get it—despite ostensibly being a setting of galactic breadth and repercussions, Star Wars is ultimately the story of the extended Skywalker family, across multiple generations. Grand stories in grand settings need anchor characters to tie them together, after all. But after living through the entire original trilogy and the disasters of the prequels, I can’t help but wish for some ability to step outside that family tree at least a little, if only for some perspective—especially when it comes to the new users of The Force. I don’t need each of the new main characters to be directly tied to the original cast members, as in the case of Kylo Ren. I truly believe Luke doesn’t need a daughter character, nor does the conflict between Kylo Ren and Rey have to boil down to (again) a family squabble. In fact, it would probably be more interesting if it didn’t. Obviously, her extreme proficiency in using The Force despite being totally untrained. Her upbringing, which, except for a change of planet name and a missing uncle and aunt, looks pretty much exactly like Luke’s in A New Hope. The fact that Kylo Ren, Rey’s potential cousin, immediately seems to suspect that “the girl” he’s informed about is much more important than she initially appears. Probably most damning, the fact that R2-D2 remains in “low power mode” (whatever the hell that means, by the way) until exactly the moment that Rey arrives at the Resistance base on D’Qar, reactivating himself in the presence of a Skywalker. Etc., etc. There are countless reasons for the average cinema-goer to suspect if not straight-up assume that Rey is somehow Luke’s progeny, which raises obvious questions about who her mother is/was and how the timeline works alongside Luke’s failed Jedi academy and the fall to the dark side of Ben Solo/Kylo Ren, who is also a descendent of Anakin Skywalker. But it all comes back to that Skywalker name—it’s like every event of any significance in the Star Wars universe over the course of decades has to be directly tied to or caused by a member of the same family, which only serves to minimize everyone and everything else. I don’t know how many fans shared this particular hope of mine, but when I first heard that the next Star Wars film would be titled “The Force Awakens,” I was quite excited about the prospect of learning more about the mysteries of The Force. I hoped to see a wizened but incredibly powerful Jedi Master Luke Skywalker establishing his Jedi “praxeum,” as he did in the Extended Universe novels, ready to rear a whole new generation of not one but many potential Jedi. The possibilities are so endless—Jedi with unique abilities and proclivities toward different aspects of The Force. Jedi from different alien races who have attitudes toward The Force we haven’t witnessed before. An expansion of the simplicity of “light side vs. dark side.” And obviously, at least one student (or their master) falling to the dark side, but perhaps in a way that didn’t have to directly involve association with the Imperial remnant. Instead, The Force Awakens suggests that many of these things did happen—only they happened before our story takes place. Granted, we’re likely to learn much more about this period in Episode 8 from Luke himself, but the fact that his academy was already a catastrophic failure has likely robbed the final trilogy of a chance to diversify its Force users in any really meaningful way, unless we get some additional Force users into the story immediately. But I digress—what’s clear in the meeting between Rey and Luke at the end of Force Awakens is that Rey most certainly does not recognize Luke as “Dad.” Luke’s look of anguish, on the other hand, could be interpreted in so many different ways that I don’t even want to get into it. Our takeaway is that Rey doesn’t know this guy at all, and if Luke is her father, that’s at least somewhat problematic. We see a young Rey very briefly in her Force vision/flashback—a girl who is young, but certainly old enough at five-years-old to remember the traumatic whole of being left behind on Jakku. Unless she received some kind of Force mind-wiping, she should really remember at least who she’s waiting for—and if she didn’t, why would it be so important to her to keep on waiting? This is something we could easily have more information on if any of the characters in The Force Awakens probed Rey more in-depth about WHY she thinks it’s so important to get back to Jakku, but no one does. It’s classic filmmaking contrivance—keep the audience in the dark about a character’s background by having none of the film’s other characters ask the obvious questions the audience so desperately wants to have answered. Let’s consider the reasons that would likely be advanced for Luke doing this. 1. After the Jedi academy slaughter, Luke wants to “keep his daughter safe” by hiding her away. So he strands her in a junkyard, in the hands of a taskmaster who doesn’t care if she lives or dies, to eke out a living as a near-starving scavenger of used parts? It’s needlessly cruel. Even if Lor San Tekka, the old man character in the beginning of the film who happens to also be on Jakku, was left there to “look after” Rey in the same manner as Obi-Wan Kenobi on Tatooine, he’s sure as hell not doing a very good job of it, and he doesn’t even live in the same community or region. How would that arrangement possibly serve Rey as a child better than being placed in foster care in some peaceful corner of the New Republic? Remember: This isn’t like Luke, who had to be hidden away on the Outer Rim, outside the clutches of the Galactic Empire, which had near total control of the galaxy. Rey was born into a time of peace, post-Return of the Jedi, and could have been well cared-for practically anywhere. And by the way; where is “safer” to be than traveling into exile with a Jedi Master? 2. Luke wants to completely shield his daughter from knowledge of The Force after seeing Ben Solo fall to the Dark Side. If Luke’s #1 priority is keeping Rey from somehow falling to the Dark Side by leaving her unaware of her latent powers, perhaps it might be best if she lived in a setting that didn’t involve fighting for her life on a daily basis. You know what kind of setting is really conducive toward discovering and utilizing Dark Side powers? Being raised in an arena, which is pretty much the life Rey has on Jakku. 3. Luke doesn’t know Rey exists. Do we really want a film setting where Jedi Master Luke is clueless to the fact that he knocked up a woman, and a setting where Rey’s mother (our Mara Jade equivalent in this universe) has ditched her in a junkyard? I’d rather see a flashback in The Force Awakens where Rey wanders away from Luke and Mom in a Bed, Bath & Beyond and accidentally boards a tramp steamer bound for a distant edge of the galaxy while they inquire about her whereabouts at the lost children corral. It could be Star Wars meets Baby’s Day Out. This is all to say that I can’t envision a scenario where Luke stranding his daughter on Jakku would be more reasonable an action than simply taking her along with him wherever he was headed. And thus, for the sake of a character I love in Luke Skywalker, I hope Star Wars ep. 8 doesn’t ask me to accept a forced explanation for why he would do such a thing. We as an audience are better off if Rey is coming to Luke in the style of a classic kung fu film—Gordon Liu arriving at the Shaolin temple in The 36th Chamber of Shaolin—as a student seeking the famed, reclusive master. 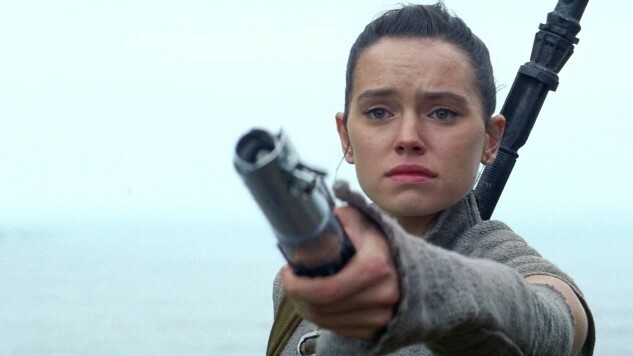 By all means, let me know in the comments if you think there’s a great reason that Rey should indeed be Luke’s daughter.